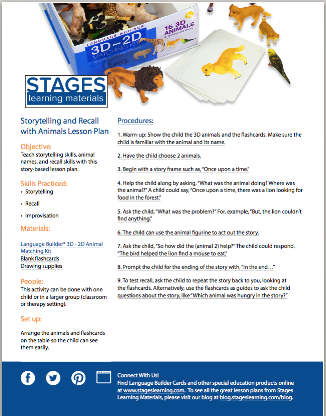 Teach storytelling skills, animal names, and recall skills with this story-based lesson plan. This activity can be done with just one child or in a larger group, in a classroom or therapy setting. Children should be familiar with basic elements of a story and with animal names. 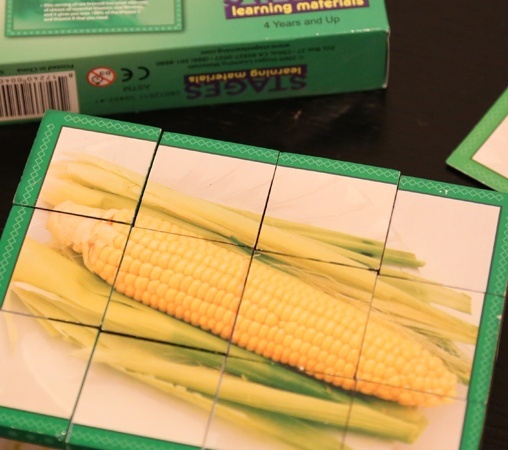 In this lesson, the child will learn how to match 3D objects to 2D picture cards of the same object. This lesson is best suited for one-on-one sessions with a teacher or therapist. The child should have mastered 3D object to 2D picture matching. 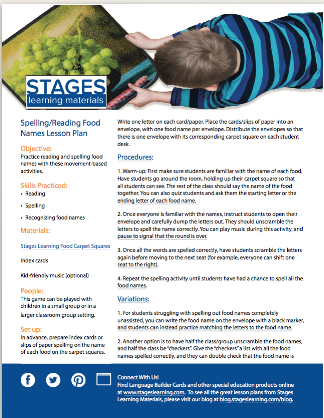 Practice reading and spelling food names with these movement-based activities. 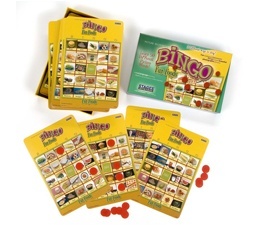 This game can be played with children in a small group or in a larger classroom group setting. This lesson is ideal for any number of students, ideally for kindergarten - 2nd grade, a beginning ELL student, or for a one-on-one session with a therapist. Students should be familiar with the emotions chosen for review in this lesson. 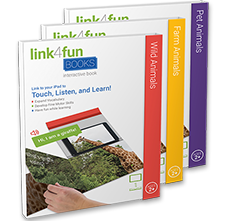 Link4fun Lesson Plan: Identify, Categorize & Communicate! 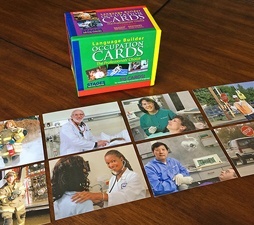 Students will use the Link4Fun Cards to practice identifying, categorizing, and communicating with vocabulary words. 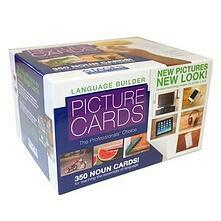 Students will interact with the teacher or therapist using vocabulary cards with interactive technology. Each part of the lesson plan can be extended or shortened depending on the needs of the child. Students will use the Link4Fun book and app to develop their literacy, social skills, and vocabulary. 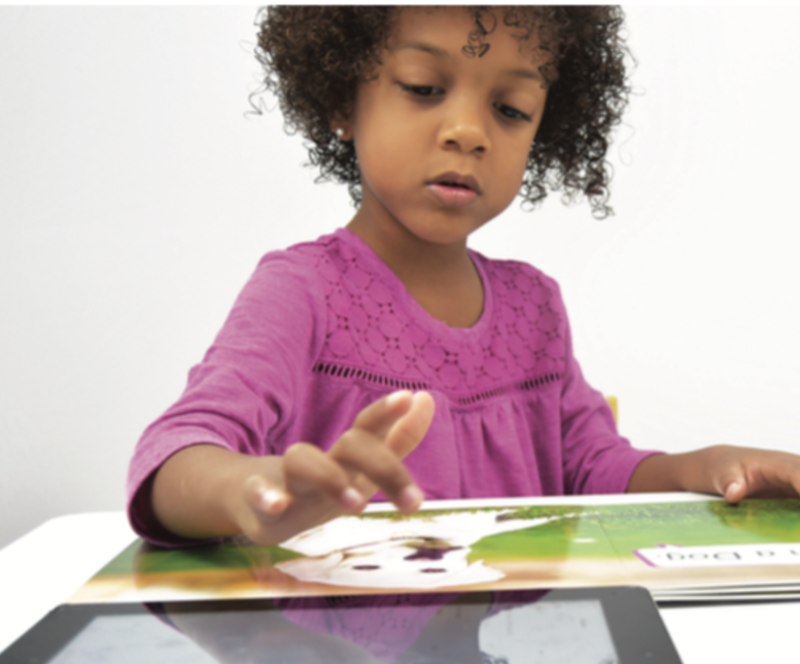 Students will interact with the teacher or therapist using a print-based picture book with a digital device for an interactive reading experience. Each part of the lesson plan can be extended or shortened depending on the needs of the child. Using the Language Builder Blocks and customized dice, children practice math and engineering skills in this creative challenge. Play this twist on hide and seek to teach collaboration and teamwork. 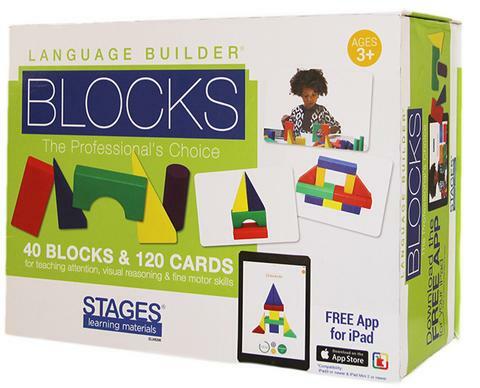 Use the Language Builder Blocks as a quick way to practice number skills. 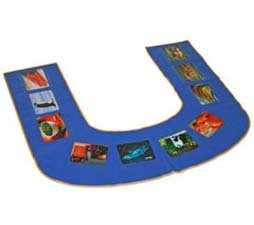 Students will use the U-Play Mat to practice identifying, categorizing, and communicating with vocabulary words. Each part of the lesson plan can be extended or shortened depending on the needs of the child. Students will use sequencing cards to review vocabulary words and practice ordering events. This lesson is designed for 1:1 instruction with a teacher or therapist. It can also be adapted for use with a small group of 2-4 students. 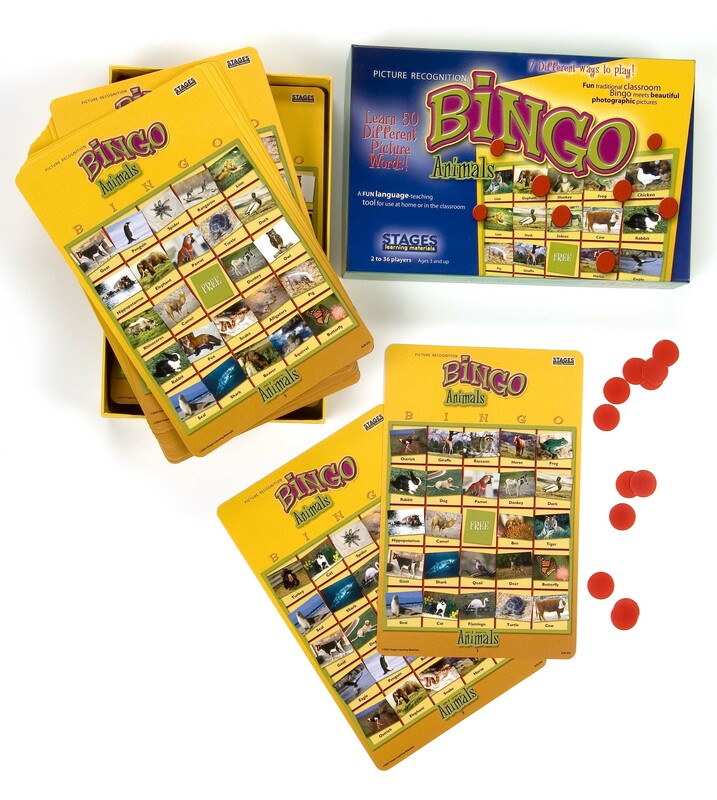 Students will review vocabulary words and play bingo using Stages Learning Bingo Generator Cards. Students can also review vocabulary in foreign languages since the Bingo Generator Cards are available in Spanish and French. Students will review the Emotion Flash Cards and create their own chart depicting various emotions. Students will then think of emotions they show outside and inside to make a feelings box. Students will make an animal that they would most like to be or admire in some way. Students will then choose a song that their animal likes and move their animal to the rhythm of the music. 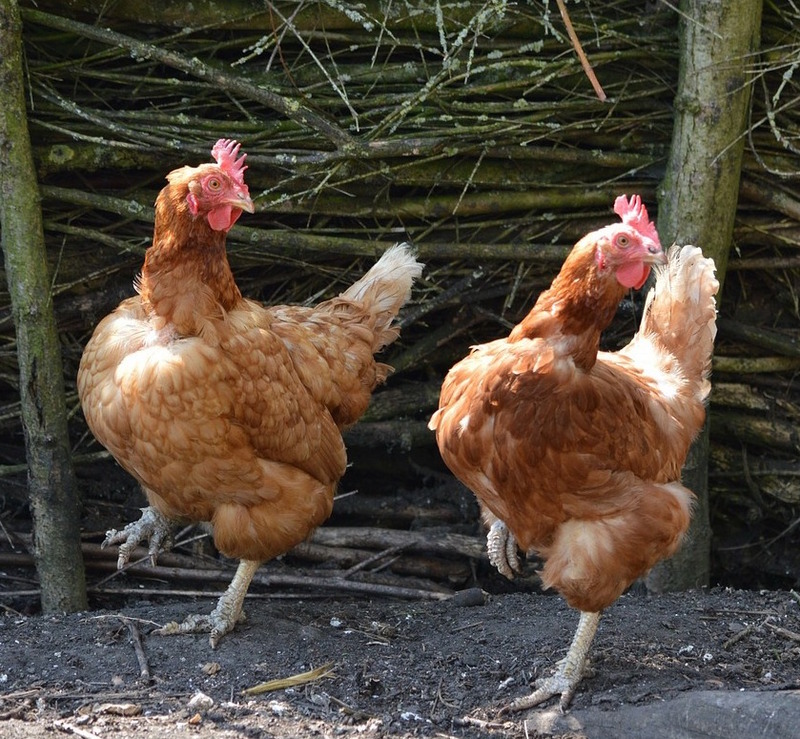 Students will then listen to various types of music and choose other animals to move, following the rhythm of the song. Students will then see how different animals might interact with each other. This is an early childhood activity that can be adapted to special needs students by breaking down the activities and reinforcing the steps separately. Students can build skills that they can use to interact with their peers. Students will verbalize an inference about the events leading up to a visual scene by explaining “what just happened” in response to visual cues. Students will infer how professionals feel at work by verbally elaborating on visuals from occupation cards. 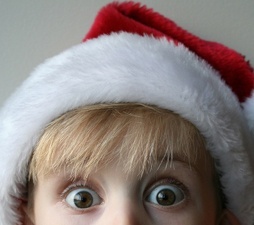 Students will match December holiday vocabulary words with emotion cards by creating a holiday sentence. 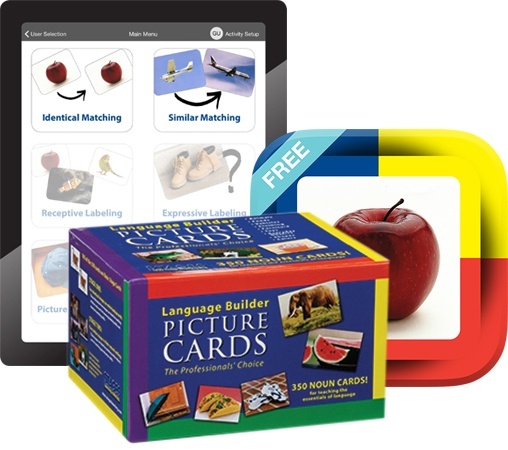 Students will use Language Builder cards with the Language Builder App to practice similar matching in both a digital and physical setting. By touching or pointing to the appropriate card, students show that they recognize the word and can identify the corresponding picture. This activity can be prefaced by the Picture ID lesson to familiarize the student with the pictures he/she is finding. 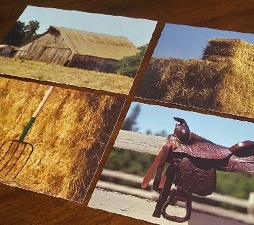 Students will practice expressive language skills by verbally identifying a picture on a card. 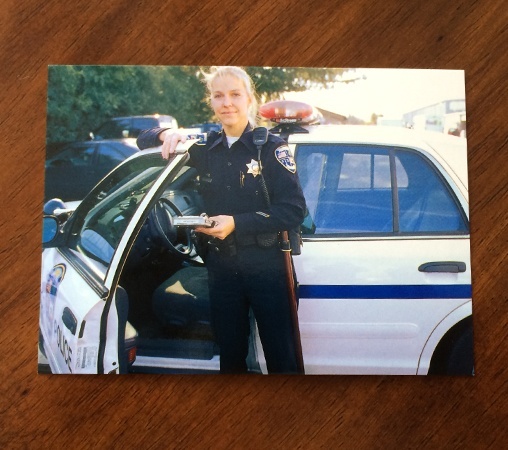 Skills practiced include expressive language, picture identification and photo identification. Students increase their understanding of jobs, tools used for certain jobs and identify features of particular workers by guessing which occupation the teacher is describing. This lesson plan teaches fine motor and receptive language skills in order to have students match identical pictures of familiar objects. 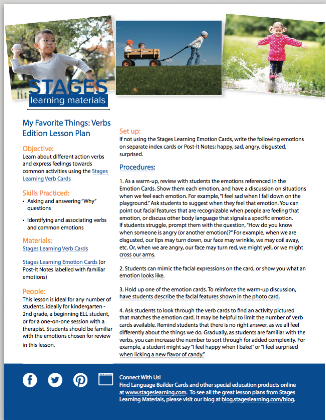 This lesson plan focuses on the uses of adjectives and other descriptive terms to discuss the attributes of objects shown in the pictures with a teacher, and develops picture identification and vocabulary skills. This lesson plan practices sentence building, picture identification and vocabulary development. Students look at pictures of objects and describe the function of each item. 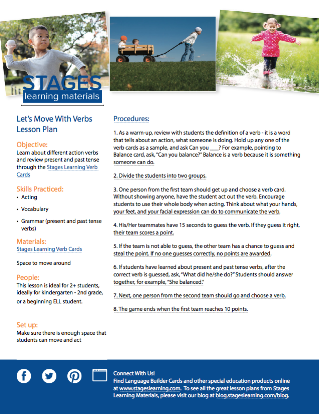 This lesson plan reinforces the idea that sometimes, you just need a little help! Students use their problem-solving skills to identify when they need help, then advocate appropriately to get the assistance they need to complete a puzzle that is missing a piece. 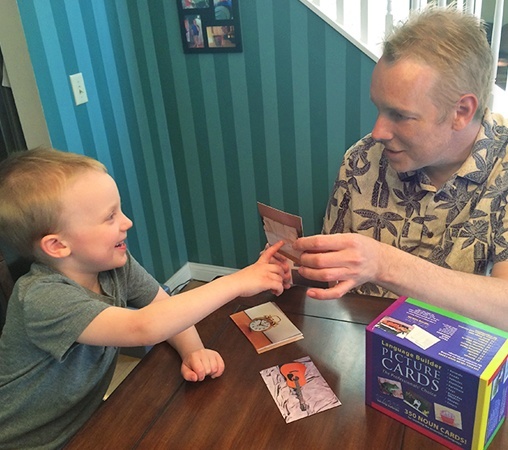 This lesson plan gives the classic card game Go Fish an emotional makeover! Students work on their expressive and receptive vocabulary and understanding of the five basic emotions, all while practicing social skills, taking turns, and following the rules of the game. So you’ve just downloaded the new Language Builder app. That means you can throw out all your paper flash cards right? NO!! As you may have already realized through our previous blogs, we are big proponents for blending hands-on and digital learning. There are so many ways that you can combine both digital and tangible resources to support deeper engagement. Our intent with the app is to complement, rather than replace, the physical products. 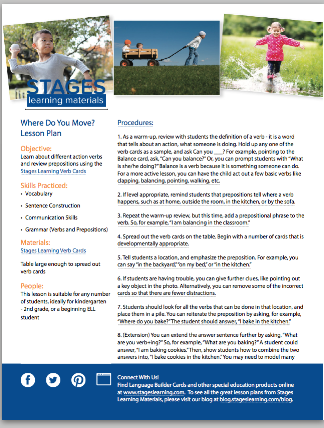 We will begin a new blog series demonstrating ways to use your physical language builder cards and other Stages products in conjunction with the app. Why Matching Activities for Children with Autism? 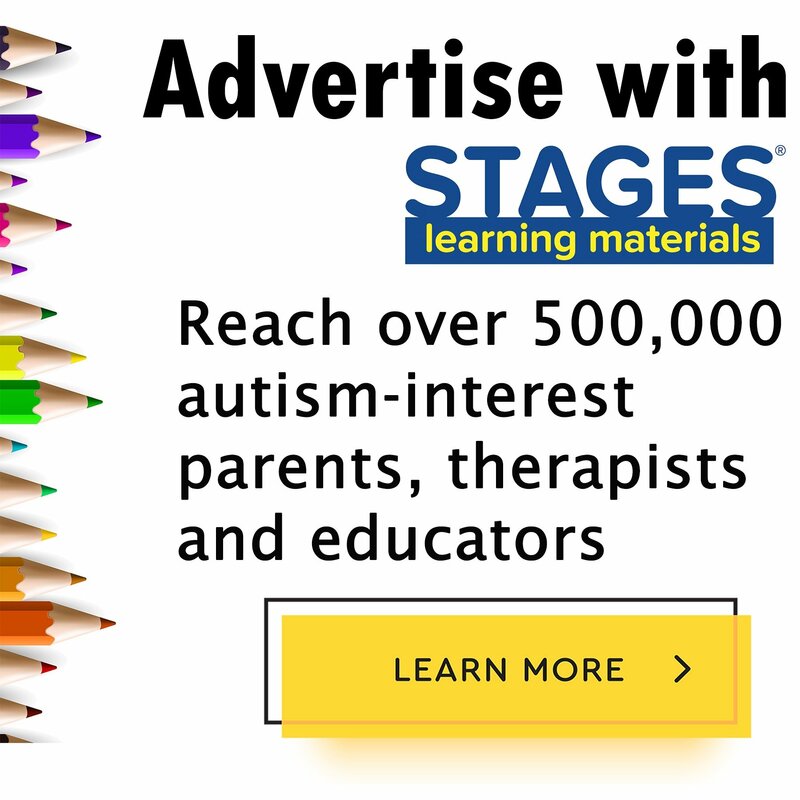 Note: These activities are excerpted from the Language Builder® ARIS Full Autism Curriculum developed by Stages Learning Materials. What does matching teach a child? How can this be a step toward developing language? 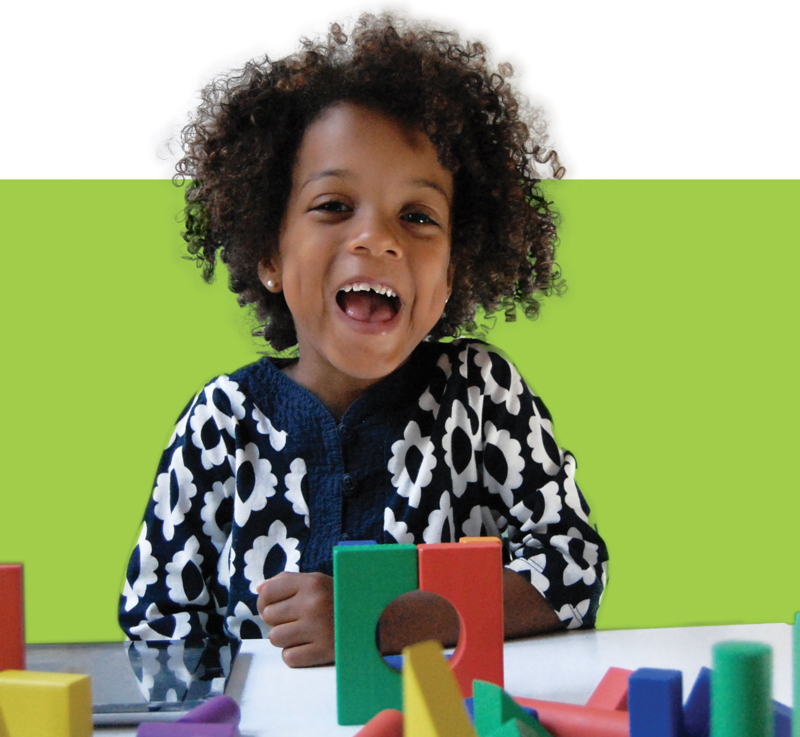 Matching skills are essential for language development for children with autism. In ABA therapy matching skills typically follow a hierarchy from the easiest and most accessible matching activities using identical physical objects to the more complex and abstract notion of matching representations of objects, such as those found in specially designed picture cards. 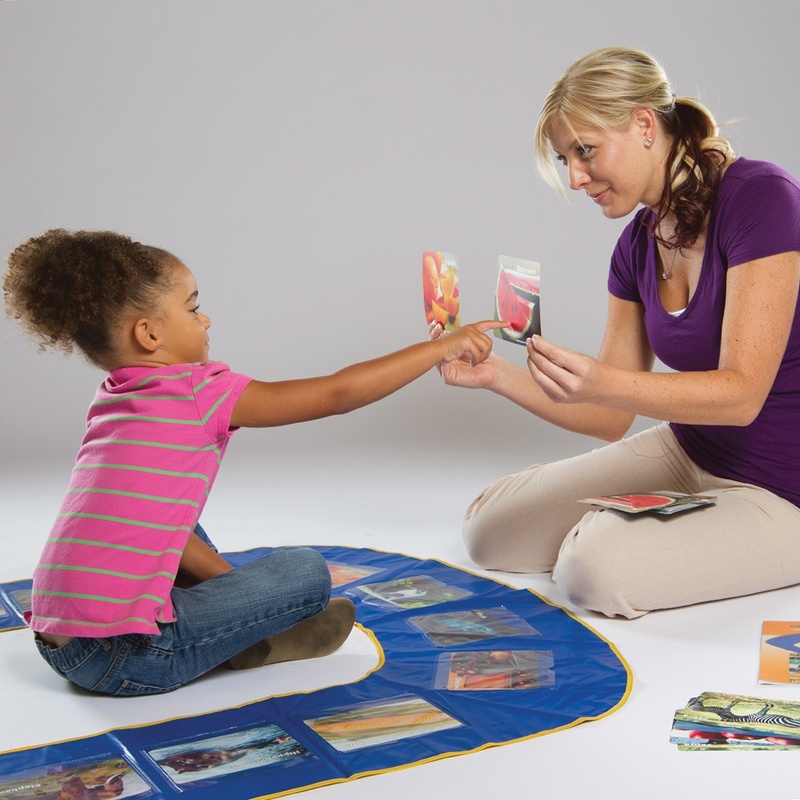 As the child advances in matching activities they are able to connect physical objects with cards that represent the objects: A big leap forward in the development of language skill learning! 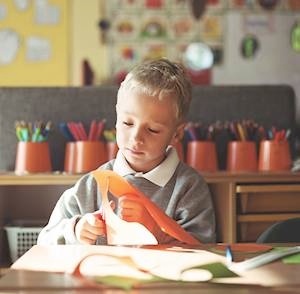 Research demonstrates that using a progression of matching activities using ABA therapy techniques provides children with scaffolding needed to develop language skills. 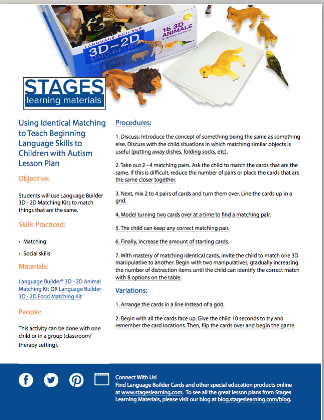 Stages Learning Materials has created Language Builder® Matching Kits specially designed to foster identical and similar matching activities using objects and cards. 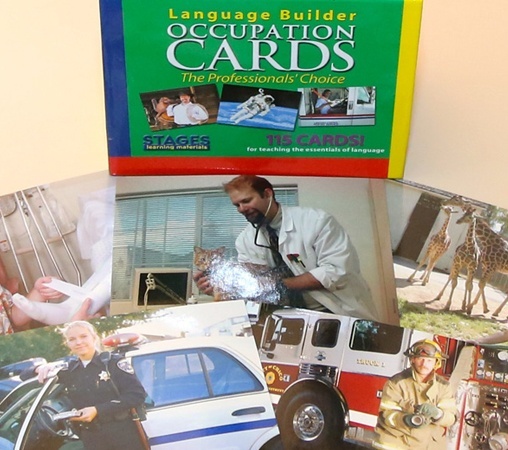 The Language Builder® series is used widely by researchers and ABA therapists. Choose a 3D object to start with. Bowls and Cups, as offered in the Everyday Object Matching Kit are often a good first choice because they “nest,” which is a natural motivator for students to stack them together. 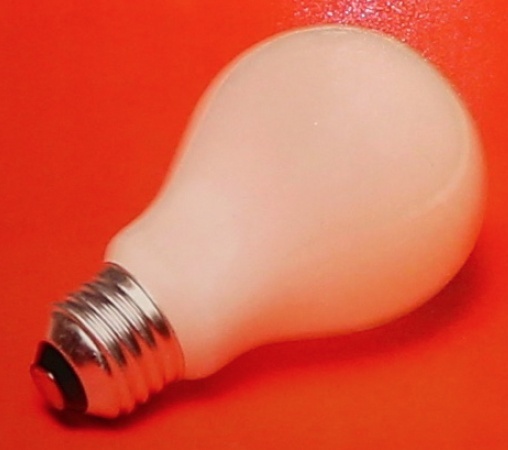 Alternatively start with an object that is attractive or motivating to your particular student. If your student tends to engage in wheel-spinning stimulatory behavior, you may not want to start with wheeled vehicles. Once the student has mastered matching one object, you can then move through the list of identical objects to match. As the student becomes more competent matching identical objects in a field of one, you can then add more objects to the field so the student will have to scan the objects before matching. Next, match objects to pictures and pictures to objects (3D - 2D Matching): Match horse object with horse card. Choose a 3D object to start with. 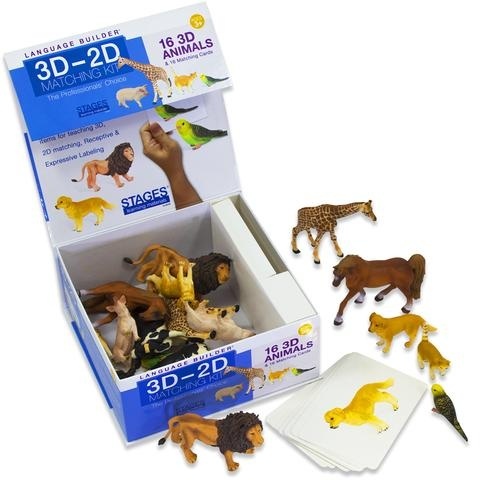 The Language Builder® 3D - 2D Matching Kits, such as the Food or Animal kits, are perfect for this matching activity. Start with an object that is attractive or motivating to your particular student. It is a good idea to choose an object with which your student has had significant success matching in the 3D - 3D matching activity. 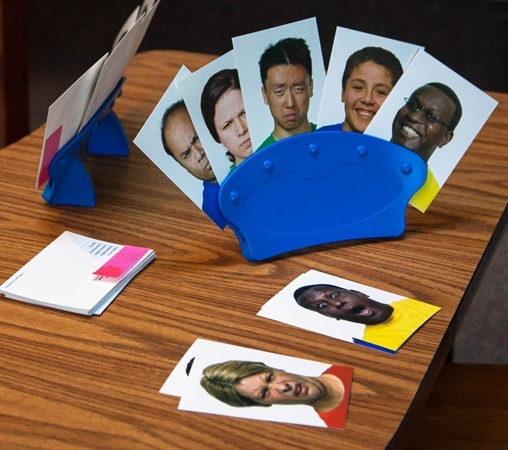 Once the student has mastered matching one object to the corresponding photo card, you can then move through the list of identical objects to match. As the student becomes more competent matching object to card in a field of one, you can then add more objects to the field so the student will have to scan the objects before matching. There are additional lessons designed for 3D - 2D matching at the end of this article. Next, advance to photo identical matching (2D - 2D): Match picture of car to picture of car. 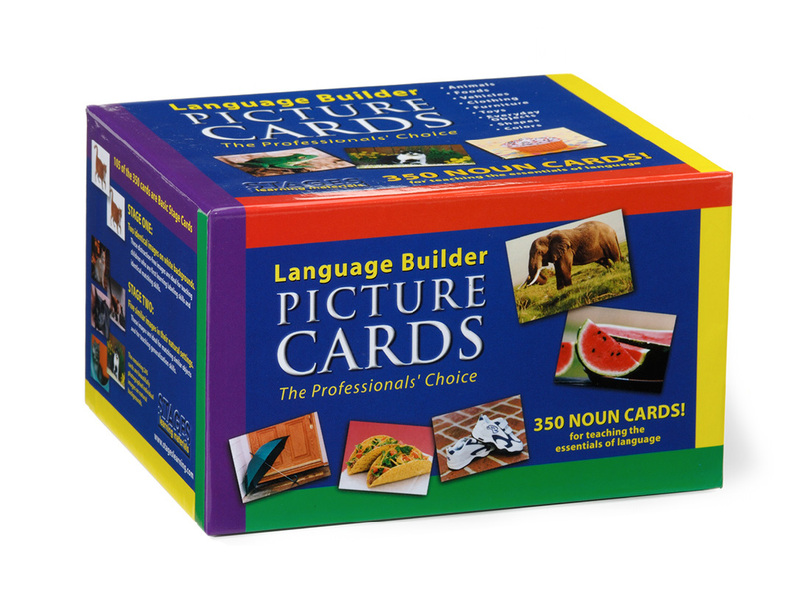 Choose a card from the Language Builder® Picture Nouns set to start. Begin with a card that has an image that is attractive or motivating to your particular student. It is a good idea to choose an object with which your student has had significant success matching in the 3D - 3D, and 2D - 3D matching activities. 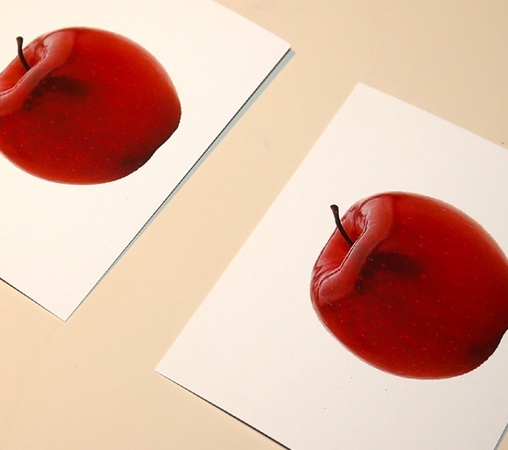 Once the student has mastered matching one photo card to the corresponding photo card, you can then ask the student to match other identical pictures. As the student becomes more competent matching card to card in a field of one, you can then add more cards to the field so the student will have to scan the cards before matching. Finally, advance to photo similar matching: Match orange cat with white cat. 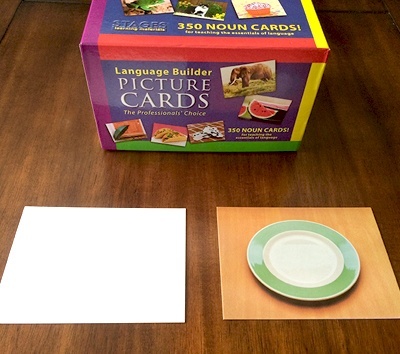 Choose a card from the Language Builder® Picture Nouns set to start. Begin with a card that has an image that is attractive or motivating to your particular student. It is a good idea to choose an object with which your student has had significant success with in previous matching activities. Basic matching is one of the first lessons taught in an Applied Behavioral Analysis (ABA) program for children with autism. Teaching early language skills to children with autism often begins with having children match identical objects. Before a child can learn that the picture of an object actually represents a real item (picture-object correspondence), the child may need to start learning by matching actual physical objects. It is often necessary to start by matching 3D objects such as cups or toy cars and later transition to matching identical images on cards (Blumberg & Hurley, 2007). 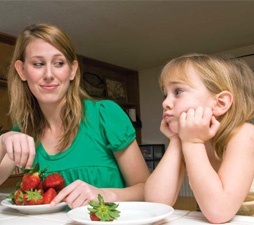 Teaching daily living skills to children with autism often depends on using activity schedules and sequencing charts. 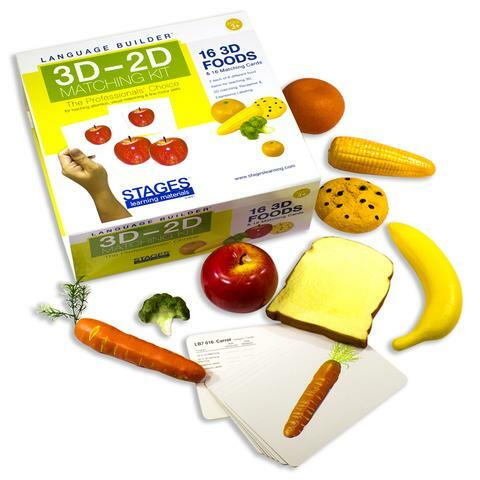 These tools are effective only at the point at which children have mastered the prerequisite skills of matching a 2D image to a 3D object (Haas, 2011). Until a child has the capacity to understand that a 2D image such as a picture of a toothbrush represents an actual object, being able to prompt a child to engage in brushing their teeth cannot be accomplished using an activity schedule or card. Some children will eventually be able to move from seeing an actual toothbrush, to recognizing a card that has a photographic image of a toothbrush, to recognizing the word “toothbrush.” Other children with more severe language delays will only be able to respond to 3D prompts (Baynham, 2007). In a study using different types of photographs, symbols, and objects to teach language skills to 40 non-verbal subjects with autism the real objects proved to be much more readily recognized than any of the other representations of objects (Mirenda & Locke, 1989). Typically developing infants and children under the age of three also learn from viewing 3D objects and often cannot process a 2D picture of an object until a later age. Researchers testing 5-month-old infants found that these infants could not understand 2-D images, but when presented with the same content in 3D representations infants were able to understand the objects. The researchers found that by examining 3D objects children naturally learn about objects in their world and that being able to examine a 3D object provides additional sensory information rather than just viewing a 2D image on a card (Mash & Boornstein, 2012). Baynham, Tanya Yvonne. (2007). Training a non-match response: Toward a technology for determining controlling stimulus dimensions for two children with autism. University of North Texas, Dissertation. ProQuest Dissertations Publishing. Blumberg, E.R. & Hurley, E. (2007). Enhancing Early Intervention for Parents of Young Children with Autism Spectrum Disorders: Information, Strategies, & Resources. New Brunswick, NJ: The Elizabeth M. Boggs Center on Developmental Disabilities. Mash, C., & Bornstein, M. H. (2012). 5-month-olds’ categorization of novel objects: Task and measure dependence. Infancy, 17, 179-197. Mirenda, P., & Locke, P. (1989). A comparison of symbol transparency in nonspeaking persons with intellectual disabilities. Journal of Speech and Hearing Disorders, 54, 131-140. 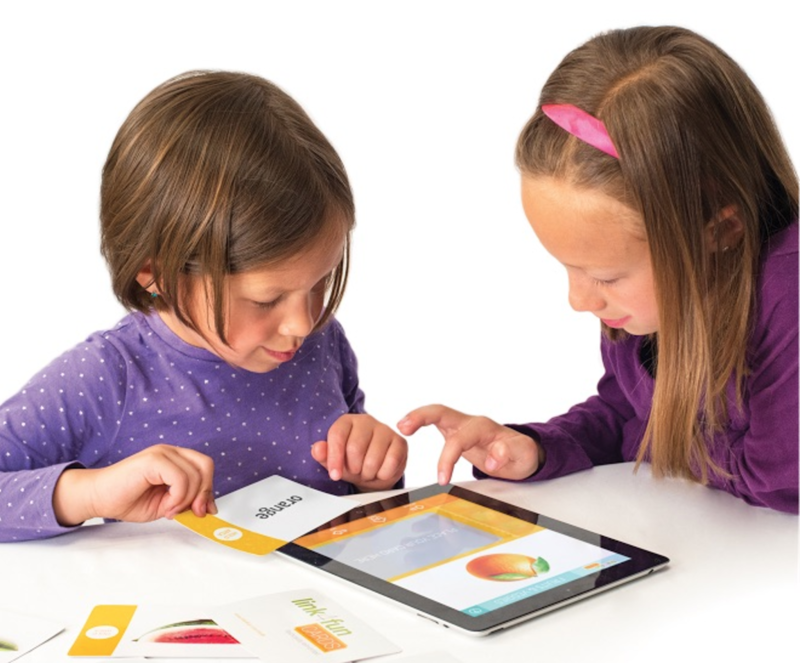 Student will gain familiarity with the Stages Cube puzzles through hands on exploration. Peer collaboration - working with others to solve a problem. Demonstrate an increasing attention span by remaining on a task until completion. Students will use Everyday Object Lang-O-Learn Cards in conjunction with Kid in a Story app to build vocabulary on common objects that can be found around the home and at school. The app enables sharing between parents, therapists, and teachers, which leads to consistency across all environments. 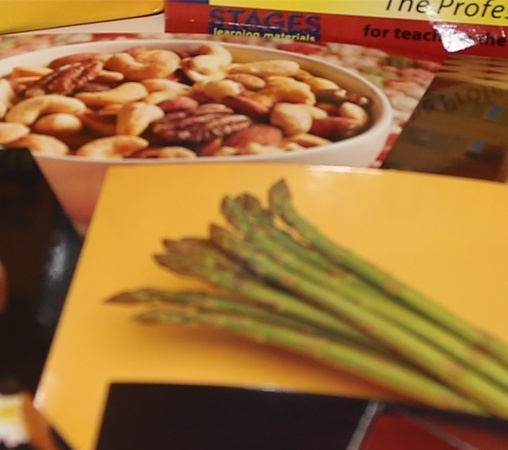 Build expressive and receptive vocabulary surrounding common objects. Sharing activities across all learning environments (home, school, therapy). Build digital and print literacy. 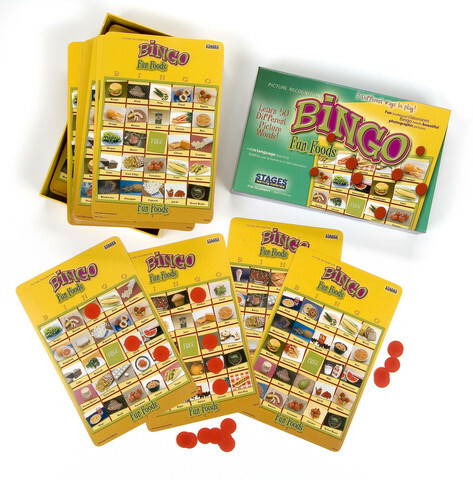 Using Stages Bingo sets provides children an opportunity to build various language skills through seeing and hearing new vocabulary words. Building descriptive vocabulary. Recognizing foods by description and providing basic descriptions for foods. 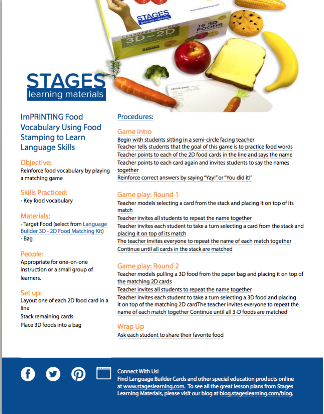 Students will use Stages Learning Memory game to practice matching things that are the same. Identify things that are the same. Engage in turn taking when working with others. 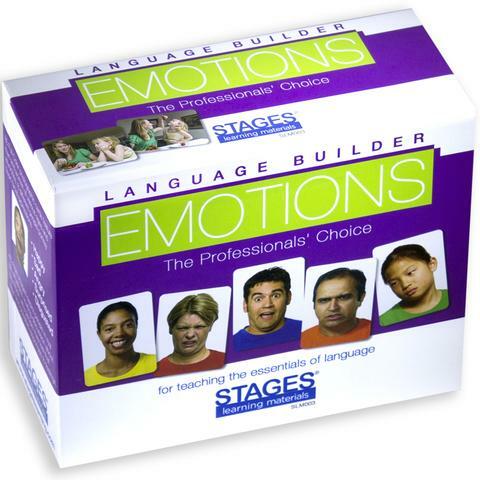 Use Stages Emotion Cards with literature to support a child's recognition of facial emotions and feelings in various contexts. Learn and name parts of the human face. Learn that people carry many cues to identify how they feel. Learn that facial expressions change as emotions change.